5 Star Collision Center has been family owned and operated since 2003 and has consistenly performed quality body shop repairs during that time. Our team has over 60 years of combined experience in the fields of auto body repair, vehicle inspection, writing estimates, automotive claims and parts research. 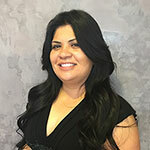 Owner Angie Jimenez is dedicated to customer satisfaction by maintaining a high level of consistent, quality auto body repair. From accurate paint matching to full structural body repair, our superior workmanship is second to none in the industry. Utilizing only the finest equipment and technology, we understand what it takes to return a customer’s car to pre-accident condition. At 5 Star Collision Center, you are not just another number. We pride ourselves in providing personalized customer service and a quick turnaround to make your repair experience as smooth and painless as possible. 5 Star Collision Center is owned and operated by Angie Jimenez. Angie has 20 years of sales and customer service experience, and has always been focused on providing the best service possible. She understands without great service, a repair is just a repair. Outside sales, marketing and public relations are a few of her many responsibilities.